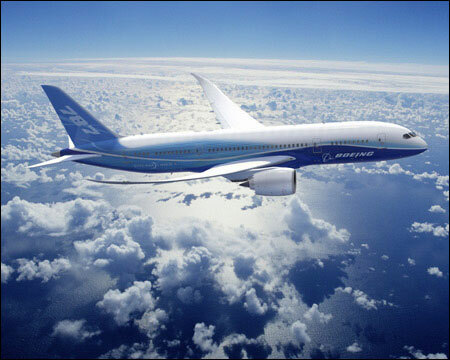 The Boeing Dreamliner 787 promises to save 20% in fuel. The hot topics right now in terms of clean transportation are electric vehicles (and the excitement the Nissan Leaf and Chevrolet Volt are generating) and America's plans to update our rail lines for the 21st century with high-speed trains similar to Europe and Asia. But what about air travel? It is one of the dirtiest forms of transportation in the world but people need to fly and at any moment there are thousands of planes in the sky whisking people to destinations around the globe. "The problem is that air travel is the "dirtiest choice of transport" in terms of the emissions that cause global warming, according to Peder Jensen, transportation expert at the European Environment Agency in Copenhagen. Though exact estimates are complicated, it is four to five times more polluting than a train for the distance traveled, and perhaps twice as polluting as driving, according to Friends of the Earth. Many estimates are higher: flying from London to Paris or Brussels produces 10 times more emissions per passenger than taking the train, according to independent research commissioned by Eurostar in 2006." So what do we do about it? Well, the European Union's Clean Sky initiative is working towards a greener aviation industry. With a budget of 1.6 billion euros shared between the European Commission and the aviation industry, technological research will go into finding solutions to make air travel cleaner and less noisy. According to the original story on the Alternative Energy news site, aviation experts expect to "achieve 50% reduction of noise and carbon dioxide emission and 80% reduction of nitrogen oxide output by 2020." Improvements will include wings more optimized to air flow, improved engine technology, long-life-span raw materials and recyclable materials, environmentally friendly plastics and innovative painting systems.